Disc & Music Echo was a weekly music paper, which was aimed largely at a teenage readership and was at the peak of its popularity during the heyday of pop singles in the mid-1960s. Writers who worked for the paper included Jonathan King, the influential and outspoken singles reviewer Penny Valentine and "house hippy" Hugh Nolan, who later became a DJ, doing Peel-influenced programmes in the early 1970s for Radio Geronimo and Radio Seagull. 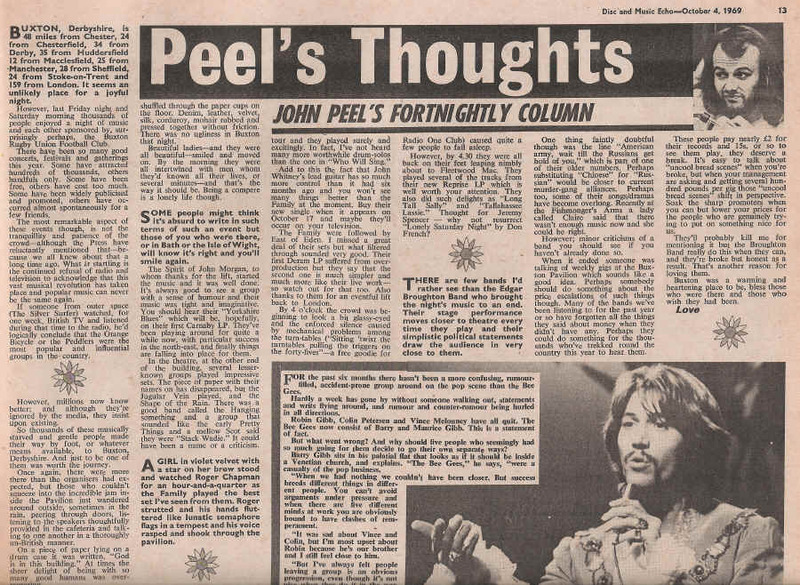 Disc was home to a Peel column for several years from the late '60s, but the paper lost influence (and circulation) as the pop audience began to diversify - hence the Pete Frame comment quoted above. During the early part of the period Peel also contributed a column to International Times; then, occasional articles to The Listener. From 1973, he started writing for Sounds. Nov 2 (John Peel's ABC Of Beauty, extract): ... Van der Graaf Generator: They seem to have disappeared briefly. Two of them (perhaps there are only two) came and sang songs for an hour on the floor of Peel Acres ... (read more). An A-Z of British artists who'd caught Peel's attention at the time, both famous and obscure ("There will be complaints that this is a purely personal and arbitrary list. This is quite true...."). Complete article, together with One Stop Records Top 20 (Captain Beefheart's LP "Striclty Personal" is at number one), available here. Unknown date (extract, reprinted Private Eye, Pseuds Corner, 1969): comparing Pink Floyd to the sound "dying galaxies"
June 20 (extract): If you can recall the Wednesday "Night Ride" I used to help with, then you'll remember the curious things from the BBC archives that were played. Some of the best are gathered together on BBC Radio Enterprises REC 68M which will be easily as hard to get hold of as the "Top Gear" LP was. It's called "Archive Things" and is quite a laugh-brings back memories of a programme that I still miss a lot. Nov. 6 (extract): If it's good music you're after--well all I can do is suggest that you try Radio Luxembourg early on Friday evenings when I'll be playing a wholesome disc or two on a programme called "Stenhousemuir 2 : Cowdenbeath 2". There is no reason at all why the programme should be thus named but I didn't want it to be called something "meaningful" and pompous so "Stenhousemuir 2 : Cowdenbeath 2" it is. Ultimately it is to be hoped that the affair will contain contributions from friends old and new, inside leg measurements of the stars and other diversions but, for the time being, we'll have to stick with good music. Sept 23 (News page - short item: "John Peel at Tiles") "John Peel's highly successful "Perfumed Garden" show opens a weekly spot at Tiles club, London, this Sunday (24). It will run from 8 p.m. to midnight." Oct 28 (Who's Who On Radio 1 series): By now it was four weeks since the station began broadcasting. Obviously Disc had graded the DJs by estimated importance and popularity, and so Tony Blackburn had received a whole page but Peel (and Pete Brady, Dave Cash and David Ryder) was alocated a couple of paragraphs at the bottom of page 11, underneath a far more important article about Cliff Richard's Christian beliefs. The last line of the piece on Peel says that in addition to contributing to the Sunday afternoon Top Gear programme, John also has a monthly news programme on "all the nice things happening in London" for Dutch TV. Dec 30 ("Radio 1 men are queueing up to meet fans at the BBC stand") "Boys And Girls Exhibition" at Olympia has been running since 1967-12-30. Peel is not due to make his first appearance until 1968-01-03, alongside Tommy Vance and also Tony Brandon. Unknown date (Readers poll, front page article): "Radio 1 Is Not All That Wonderful ... But Peel IS!" March 23 (Scene gossip column): John Peel's late night Wednesday Radio 1 show is getting back towards his Perfumed Garden days...last week he played 17th Century French Baroque music, the Stones, San Francisco's Blue Cheer and far-out modern jazzman Sun Ra and his Solar Arkestra, plus poetry and stories. Nice! (As the issue would have hit newstands on Thursday the 21st, the show referred to appears to be the Night Ride of 13 March 1968, only the second one broadcast). March 30 (Grapevine column, "John Peel Show On Radio Luxembourg"): And here's some news from your friendly station of the stars. Radio Luxembourg is planning to pull John Peel into their new-look programmes which start this weekend. With such top Radio 1 names as Tony Blackburn, Alan Freeman, David Symonds and Pete Brady already signed up, 208 have invited Peel, the personality everybody seems to want, to host his own show six nights a week, between 12:40--1:10 am, with the tentative title "The Other Side Of The Track". In fact this is to be only a pseudonym for "The Perfumed Garden" show which won him fame with Radio London. ↑ In April 1968 Taylor returned to England to work for the Beatles again, as the press officer for their newly created Apple Corps. 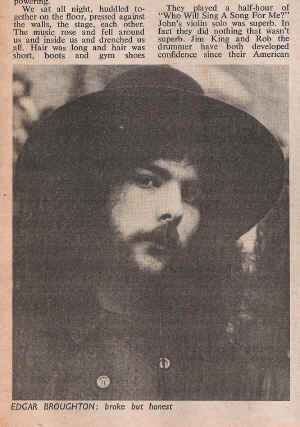 After that, he joined the newly launched UK record company WEA, where Peel's manager Clive Selwood was also employed as manager of Elektra's London branch. One of the acts he encouraged was the Liverpool band Deaf School.